It's been quite some time since I've spent a little quality time with the ferals so I decided to do so yesterday. Here are a few pictures. These guys were right next to me. I think we were discussing in another thread how some of the ferals will spread their wings while eating with the flock. It seems like I've always got one or two who do that. And a couple even ate out of my hand. **** Stay well and take care of yourself. * You are exactly right. Just sitting and watching the birds is so relaxing. *** Our yard has never looked this bad. I love puttering in the yard but just haven't had it in me the past fw months to keep it up. 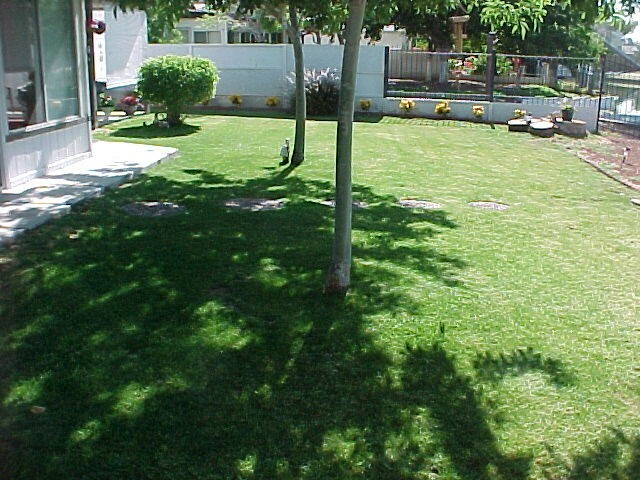 This is what the yard usually looks like. Wonderful pictures, Cindy! What lovely, healthy-looking birds you've got there, and so friendly! The open wings of the one in the top picture form a perfect inverted heart! I'm sorry your grass is so dry at the moment. The plants here are getting dry roasted too, except for the ones that get watered constantly. What lovely, healthy-looking birds you've got there, and so friendly! * The open wings of the one in the top picture form a perfect inverted heart! ** I'm sorry your grass is so dry at the moment. The plants here are getting dry roasted too, except for the ones that get watered constantly. * Good eye. I hadn't really paid any attention to it, other than the wings were spread. ** Hopefully things will begin to return to normal around here and I can once again get back to my yard duties. 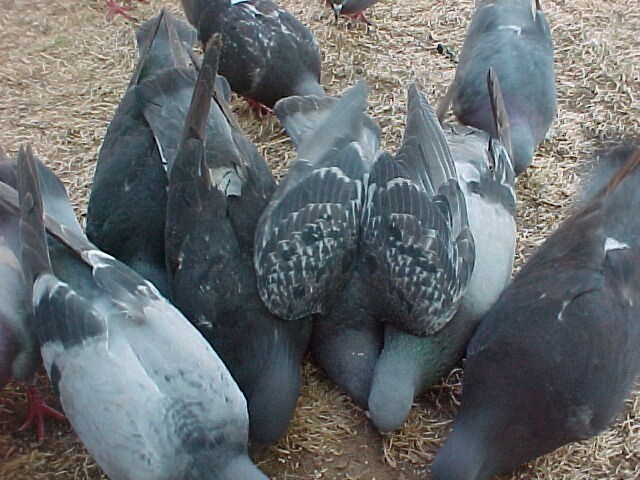 Can some of you give us advice on how to create a less dependent pigeon flock? 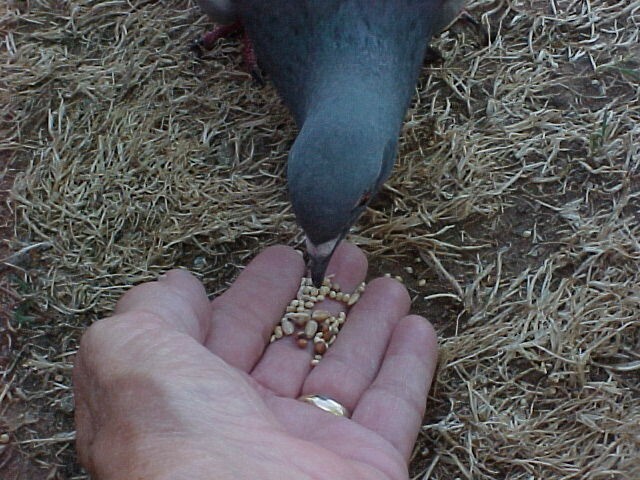 We have faithfully fed feral pigeons along our private laneway for fifteen years or so. We now have a flock of about three dozen. Our neighbours are not happy with this as the pigeons perch on their roofs adjacent to our home. (We live in downtown Toronto, Canada, and live in an 8-plex apartment building with a flat roof so the pigeons like to sit up there , as well.) I have been reducing feedings all summer so that it is clear our little flock is very hungry but still, they do not seem to be foraging as much as they should. I now give them one feeding each day, varying the intervals, just enough that food is gone in about five minutes. Then nothing more for another 24 hours. I feel badly because I am sure the birds are hungry and worse, winter is on its way and Toronto is cold. Can one of you give me an idea on how to proceed to make the pigeons seek food elsewhere without actually harming them by just cutting off the food supply here? I'd better add that we are the Landlords of the building. We do a lot of animal rescue and joke that we are the only Landlords in Toronto who hide the pets from the tenants!! Grateful for offered advice. Hi humewood. 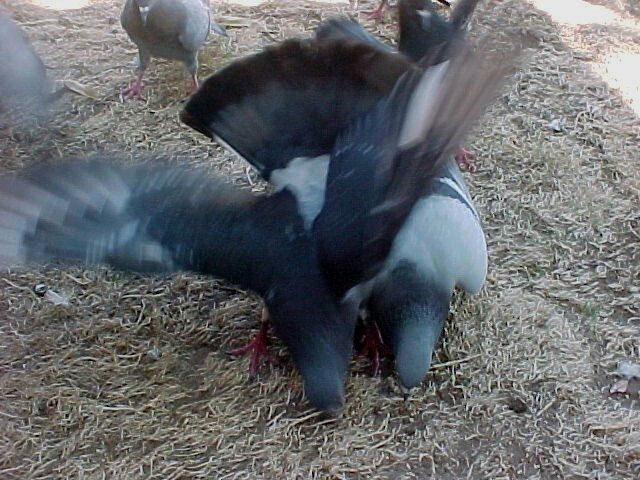 Welcome to Pigeon Angels. It great to have you here. You have presented an excellent question. I have run into the same problem. A few years ago I had in excess of 150 pijjies coming to our backyard. I think our saving grace, with regard to the neighbors, is that we live on a lake and we had a menagerie of feathered friends visiting. Dove, grackles, ducks, woodpeckers, and an occasional roadrunner. Cutting down on the feeding is the only thing I could think of doing, as much as I hated to. And it finally did help. How long have you been working on this? Others will be along to offer their suggestions. "I'd better add that we are the Landlords of the building. We do a lot of animal rescue and joke that we are the only Landlords in Toronto who hide the pets from the tenants." I love that!! My kind of landlords. Thanks for the reply, Fancyfeathers. I will keep you all posted on cutting down on feeding process and how long it takes to make our little flock less dependent. We have resolved to feed over harsh winter months. Here in Toronto, temperatures can dip to minus 20 Celsius some days or nights. (0 Celsius is the 32 degree F freezing point. ) Several winters ago, an extremely rare Gyrfalcon from the High Arctic visited our fair city and temporarily took up quarters on the Canada Malting building by the shore of Lake Ontario. He spent his days hunting Canada geese and ducks but one day, he flew up Bathurst Street and hung a left onto St Clair Avenue. He found our building on Humewood Drive and immediately cleared the area of all pigeons. His wingspan was about four feet and when he circled above or landed on our roof there was dead silence amongst all the other birds as they hid away. Gyrfalcon only came one year and then, never again. Not cold enough for him, I guess. I realize falcons and hawks are extreme predators for our other feathered friends, but they are magnificent birds. I'll bet watching that Gyrfalcon so upclose and personal was quite a sight. Hi Humewood, and welcome to PA! That's a really difficult decision to have to make, when outside pressure demands that you discourage the visiting pigeons. Essentially, what you are doing is what is prescribed, i.e. 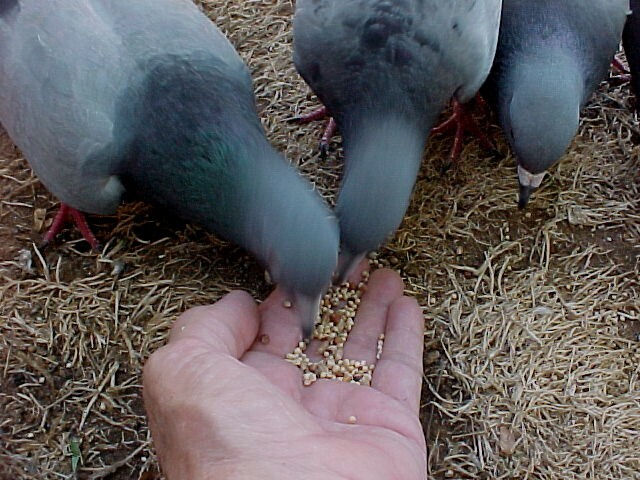 that finding less food available will force the pigeons to forage elsewhere outside feeding times. That is the theory, anyway, but you'll always be worrying, especially as the weather turns colder. A more radical (and expensive ) idea, would be the possiblity of building an aviary for them on the flat roof, if you have exclusive use of it. That would provide them with shelter, food and clean water, and it would give you the means to humanely control their numbers, by replacing some of the eggs with dummy ones. Would that be at all possible? On a lighter note, we need more landlords like you! 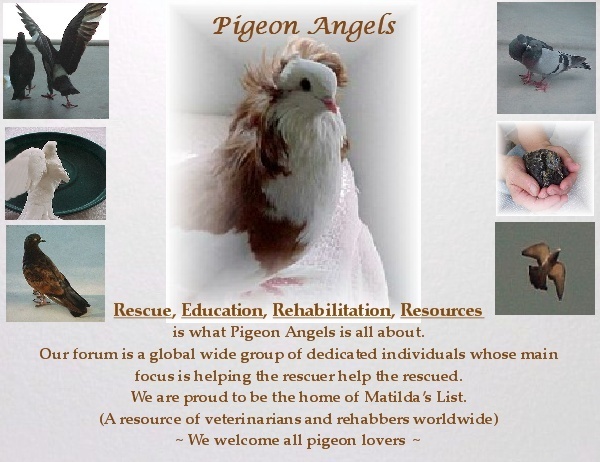 Perhaps ultimately you need to get rid of your insensitive tenants, and advertise for new ones in the pigeon forums! Judging by the number of disgruntled tenants who would like to keep/rescue birds and are not allowed, you might be on to a winner! So many of us face a dilemma such as yours and it's very painful. It's hard to feel good about being full and cozy inside, when it's cold outside and you know full well that the pigeons your care for so deeply are cold and hungry. What are the laws in Toronto regarding feeding the pigeons? Is there a place near by where they could be fed? My personal experience is that the only thing that makes the pigeons go else where is when birds of prey put the feeding location on the daily tour. Thanks to all for help. Here in Toronto, the rules for feeding feral pigeons are pretty generous. Essentially, the By-laws are triggered by complaining neighbours who find a large flock threatening or messy, if the flock chooses their window sills. In our case, we do have to worry about health hazards as we are an apartment building. Landlord Tenant Law here in Ontario is so onerous to Landlords, and so punitive, that we would have the Health Dept on our case very quickly if a tenant ever complained. Luckily, our tenants are pretty tolerant but as the flock grows, there may well be a problem. I will start by blocking up the two highly successful nests in our eaves because the bird droppings drop down onto the copper roof over the front entrance and near tenant windows. We will only do this if there are no babies in the nests. These two nest areas have become so successful we probably get six or so new babies a year! Cutting down on the food and closing the nests will likely help alot. There will still be winter shelter around the building but just not so successful for nesting. Oddly and on another topic, our pet cats regard these feral pigeons as our pets and sit by watching them feed without attacking them. Needless to say I keep a close eye on things to prevent any carnage. Another thought...if you can get to the eaves, perhaps you can replace the eggs with wooden ones so there will no babies. Very busy time here at Humewood Court and I lost my password to the forum, to make things worse. Anyhow, an update on our little flock. We have trained them to one early morning feeding only, seed, raw peanuts, whole wheat bread, a bit of dog kibble etc and then that is it for the day. For a while, the birds would fly around my head when I went out to the garden and look at me reproachfully from the fence. Now though, they know that one feed is all they get and go off and spend the rest of their time sitting on the belfry of St Matthew's church or pecking around our private road or the rest of the neighbourhood. They behave now less like welfare bums and more like feral pigeons. Last week, I passed one down at the corner of our street outside a Mr Submarine store, pecking on a piece of pizza! I feel this is a good sign. Our plan now is to cut out feeding entirely by mid May. It has been so cold and rainy here, we did not follow our original plan to stop in April. We will start up again with a once daily feeding in November just so they don't suffer unduly. I will let you know how things go. Appreciate the update, humewood. I'm glad to see you were able to get logged back on. Thank you, Teresa, for helping to get humewood's update posted.